21 November – Sheffield Chasing Sprint – forecast not looking great, but should be a great set of two back-to-back races. Final race in the Nopesport Urban League series. 22 November – Epping Forest East – one of my favourite areas, and cycling distance from home. 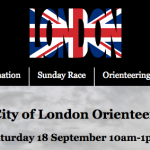 29 November – OK Nuts Trophy – my club’s biggest terrain event of the year. 25/26 December – Edinburgh parkrun? 27 December – ELO Festive Frolic? 1 January – JOK training event in the Highlands? 24 January – CSC Qualifiers, Leith Hill?